It's always been said that actions speak louder than words, but boy do words carry weight. As an encourager of people, I have been blessed to write a few children's books. With the sole purpose of inspiring the reader through images and text, these are my babies! I'm proud of them. It would mean so much for you to take a look and make them a part of your collection. Available Now: Click on the book cover below to purchase. Just Above My Heart, chronicles the unique bond between a mother and daughter. In this coming of age story, a mother fondly remembers all of the moments she comforted her daughter, in that very special place, beneath her chin and just above her heart. Throughout the story, she reminds her daughter that she can still find comfort in her mother's arms. Journal entry pages make this book a wonderful keepsake for mothers and daughters of all ages. Sneak Peak: In that place beneath my chin and just above my heart, you found comfort after a fall. 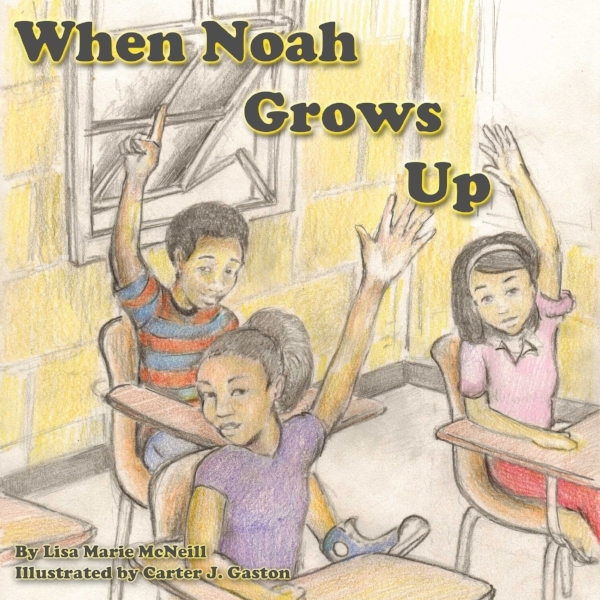 This story, McNeill's third in publication, demonstrates the power of positive thinking, as an ambitious 2nd grader, Noah, talks about all of the things he could be, when he grows up, including entertainer, surgeon, and President of the United States. The realistic images, created by Atlanta artist, Carter J. Gaston, allow Noah's confidence to jump off of the page. Proverbs 18:21 and 23:7 are highlighted in this story. This book includes a Gems to Remember segment for parents, and Fun activities, for children. Sneak Peek: Noah was the first to speak. " I can be anything that I want to be. Do you want to know how I know?" he inquired, confidently. "Because we all have possibility." In this story, the beauty of dance and the wonders of human creation infuse, as classes of beautiful ballerinas learn how each unique characteristic that they possess was distinctively created for dance. Inspired by the extraordinary choreographer, and Artistic Director of, The McClendon Performing Arts Institute, in Atlanta, Ga. - Mrs. Denise McClendon. Sneak Peek: “Sure, your hair may not "wiggle", as you innocently proclaim, or flow waaay down your back. But you can style your hair like a crown on your head. Now, when the sun shines on your beautiful crown, it changes from deep brown, to auburn, to red." Ashlee has an important question for her mommy: "How do you know that today will be a good day?" Good Morning Brown Butterfly illuminates Proverbs 17:22, "A cheerful heart is a good medicine." Author Lisa McNeill shares a delightfully warm story about a mother who prompts her daughter to start each new day with "good morning." This story contains a Gems to Remember segment for parents and Fun Activities for children.